Target-specific activation of the immune system. If there is a large number of circulating tumour stem cells, target-specific activation of the immune system through immunotherapy is recommended. Immunotherapy means that the patient’s own natural killer cells (NK cells) are reproduced in the culture and returned to the patient in order to specifically strengthen the immune system, and to achieve immune competence against malignant cells. The NK cell perforates the tumour stem cell, injects cell-dissolving proteins and thereby forces it to dissolve into its components. The immunotherapy works through increase of the endogenous natural killer cells. The NK cells are a subgroup of white blood cells that are able to recognise and kill degenerated cells such as tumour cells, tumour stem cells and cells infected by viruses. NK cells are part of the congenital immune system. These cells are under-represented and have a reduced immune competence in immunocompromised patients and people with tumours. We acquire the NK cells from the patients’ own blood using leucocyte apheresis. The apheretically acquired cells are divided into various fractions by a density gradient. Afterwards, the relevant cells are washed multiple times until the desired degree of purity is achieved. This method, called purging, ensures that no tumour cells/tumour stem cells are cultivated as well. We reproduce the NK cells under ideal conditions in a cell culture and return them to the patient multiplied by way of infusion. We monitor the tumour cell number to verify effectiveness of the therapeutic measures. What does immune therapy do? 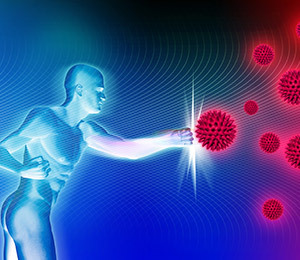 By multiplying the body's own killer cells we activate the immune system target specific. Among other things for the treatment of cancer and viral diseases.